Milina is a charming and picturesque seaside village located on the eastern shores of the Gulf of Volos and the starting point for your sailing vacation in the lush and beautiful islands of the Sporades. The yacht charter base in the Sporades is nearby Porto Vathudi, which lies in the lee of the little island of Alatas, protected from the prevailing winds. 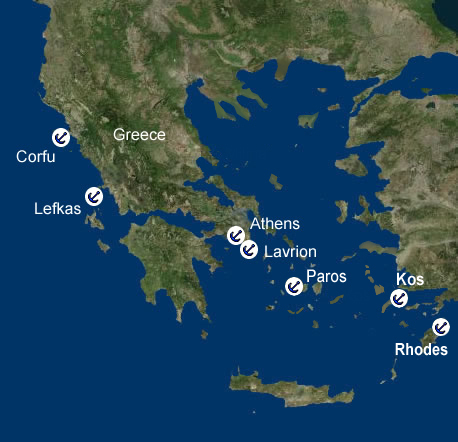 While remaining unspoilt by tourism, Milina has a good selection of tavernas and a few local shops where you will be able to pick up provisions before setting sail. Paleo Trikeri is the only inhabited islet in the Gulf of Volos (also known as the Pegasitic Gulf). It was settled from prehistoric times until it was abandoned in the 16th century due to piracy - now it is home to a permanent population of less than fifty. The island is about a mile (1.7 km) long and consists of little more than some olive-covered hills and a few dirt tracks on two lovely rocky beaches on the north shore. Al Yianni is the only port village and visiting charterers keep its single shop, bar/café and couple of tavernas in business. This is the pace to moor your Paleo Trikeri Gulf of Volos yacht charter while you explore the island - not something that will take too long, given its size! From Al Yianni, it is a 15-minute walk to the 19th century monastery of Evangelistrias near the middle of the islet. There is a lovely courtyard with marble mosaics under the portico and the cells are being restored for future inhabitation by nuns. 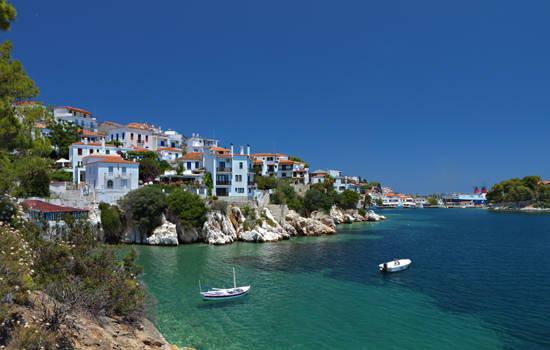 Skiathos is a lush green island with the best beaches in the Sporades and your Koukounaries Skiathos yacht charter allows you to explore them all at your own pace, lingering at the ones you like best. Koukounaries is the third largest settlement on the island. The main bay is surrounded by the umbrella pines that give the sparkling golden sand beach its name, and wooden walkways traversing the sand to cantinas serving drinks and snacks. The water here is incredibly clear and there are hundreds of different types of fish so the snorkeling is great. Behind the beach there's a lovely small natural lake, Strofilia. There are good watersports facilities as well as horse-riding stables. Across the headland, Banana Beach (officially Krassas) is among the trendiest beaches on the island with watersports, a couple of bars and naturism for those so inclined. Small Banana beach is well-suited for alternative lifestyles. There's a more family-oriented beach at Ayia Eleni and there are others at Mandhraki and Elia, both of which have sun loungers and snack bars - although you can avoid the crowds by anchoring off shore and swimming from your boat. If your mood changes for something more cultural, make an excursion to the beautiful 18th century Evangelistrias monastery and its small museum housing ecclesiastical and rural-folklore exhibits. Kastro is a fortified settlement built to protect the island from pirate raids in the 16th century - it's quite overgrown now but one of the four remaining churches houses some original frescoes that are worth a look. Watch out for dolphins as you sail east from Skiathos to neighboring Skopelos, which is more rugged and less-developed than Skiathos. The island is covered in forests of pine, but also olive groves and orchards of plums and citrus fruits for which Skopelos is famed. Skopelos has been occupied at various times by the Romans, Venetians, French and Ottomans, and its entire population is said to have been murdered by the pirate-admiral Barbarossa in the 16th century. Things are quieter these days, but there was a fair amount of excitement on Skopelos a couple of years back during the filming of Mamma Mia in various locations on the south-west coast of the island when Pierce Brosnan, Meryl Streep and the rest of the film's starry cast took up residence. Glossa, with its hillside houses distinguished by painted wooden trim and grey slate roofs, is one of the prettiest and sleepiest towns in the Sporades. Located near the northwest tip of the island, Glossa is much more rural and less developed than Skopelos Town, the main settlement of the island. There are a couple of tavernas serving local specialities such as pork with prunes and in the small main square on one of the higher hillside terraces of the village, the locals sip coffee under the shade of a large mimosa tree. On a Glossa Skopelos boat charter, you can explore nearby beaches on the northeast-facing coast. Perivoliou is the best - it's scenic, sandy and has enough surf for body-boarding. Ayios Ionnis Kastri is a picturesque church perched above a sandy cove and makes for an idyllic anchorage on a Glossa Skopelos yacht charter. Mooring: Stern-to on the town quay at Loutraki, a couple of kilometers away. Khondri Ammos is a large bay located on the northern shore of the Trikeri Channel which separates Evia from the Trikeri peninsula. The coast is mountainous on both sides with the steep mountains of the Trikeri peninsula dropping sheer into the sea. The mountainsides are scarred and scoured by quarrying and mostly devoid of vegetation and habitation. There are no facilities at Khondri Ammos, but it is a pleasant place in which to drop anchor and simply relax on deck, or swim and snorkel in the deep blue waters. It is better suited as a lunchtime anchorage than as an overnight stopping place. Nearby is the village of Platania, named for the many plane trees which surround it, which has some facilities for visiting charterers and a few good, laid-back tavernas, making it another good stop-over on a Khondri Ammos yacht charter. Mooring: Anchor in a cove on the north side of the bay in 16-26 feet (5 - 8 meters), the holding is good. The picturesque village of Pegadi on the western side of the Gulf of Volos is reputed to be the place from where Achilles set sail on his journey to Troy. It is quite a climb up the hill to the lookout tower of Achilles for spectacular views out over the Gulf and towards Skiathos. Reluctant members of your crew may be incentivized by the promise of a long and leisurely meal with plenty of liquid refreshments at one of the waterfront tavernas. Don't expect anything fancy, but the eating establishments in these parts have a reputation for delivering authentic Greek cuisine using the best of local produce. So if you're up for simply-grilled lamb or super-fresh fish, served with plenty of Greek salad and washed down with local wine, either retsina or one of the new generation and more sophisticated Greek wines, then you can be assured of some fine meals. There are kite-surfing and kite-boarding facilities in the bay and windsurfers can get lucky with the breezes too. Mooring: Stern-to on the harbour dock. To Do: Climb to the lookout tower of Achilles.